B&H Publishing Group, 9780805440331, 262pp. 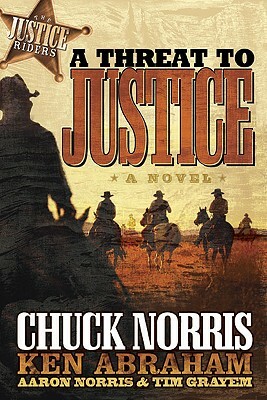 Grant and his efforts to reconstruct America, Justice rides again. This heroic action tale of good versus evil, with elements of faith and romance, takes the Justice Riders everywhere from the Ku Klux Klan-ridden deep South to the adventure-filled goldmines of California. Chuck Norris is known as an action-adventure movie and television star, but considers his humanitarian works with the Make-A-Wish Foundation(R), his own KICKSTART program for kids, and other organizations his greatest accomplishments. He lives with his wife and their children in Dallas, Texas.Ken Abraham is a "New York Times" best-selling author who has cowritten books with Joel Osteen ("Your Best Life Now"), Chuck Norris ("Against All Odds"), Lisa Beamer ("Let's Roll"! ), and Tracey Stewart ("Payne Stewart: The Authorized Biography").Aaron Norris, a military veteran and martial arts expert, is also an actor, producer, director, writer, and president of Norris Brothers Entertainment.Tim Grayem is a film writer in Santa Clarita, California.